This page details the background behind the creation of The Da Vinci Game, if you're interested in finding out more about the game itself, please visit The Da Vinci Game official website. In 2003 I was at home with my two young boys, enjoying playing with them and watching them grow. Martin, my husband, was missing out on this idyllic time, working in the city. On the days when I didn't feel so motherly and had trouble living up to the role I would sit and watch programs about trading up, changing rooms, invading gardens, etc. I found myself watching more and more of the relocation programme's and felt a yearning to return to France, where as a child I had had a wonderful holiday. Now, age 40, that did seem an awfully long time ago, Martin is 12 years younger than me, so his energy made it seem possible, even with no French. We put our house on the market in Gillingham, Kent and set off to France on a ten day house-hunting holiday in the Languedoc with a handful of properties to look at, the first of which put the whole shebang in perspective. The sellers casually informed us that they had removed a central beam and the top floor now nestled gently on the floor below, but we weren't to worry. After that the houses progressively improved until we found a huge house in the small bustling village of Couiza that could be converted into three apartments with what know-how I had gleaned from the telly. We made an offer which was accepted and sold our house in the UK. We were now able to put our budget together and after much detailed analysis we calculated our buffer zone to cover any emergencies. It was £13.50. Feeling this was adequate, we took the plunge. After long months of painting and decorating, putting in kitchens, fixtures and fittings, and endless shopping to a point beyond exhaustion, we welcomed our first guests. During this time, Martin had caught up on the quality time with his sons and due to their inexhaustible energy he claimed to be as worn out as me. As our first few guests arrived, we realised that many of them were not just on holiday, but were authors, film-makers, photographers and people in search of a story, the draw for all of them being the little village of Rennes-le-Chateau, perched on top of the hill overlooking Couiza. On a visit to Rennes-le-Chateau to see what all the fuss was about, I found a book called Key to the Sacred Pattern by Henry Lincoln. It was so exciting that I immediately started reading anything I could find on the subject, including The Holy Blood and The Holy Grail, which he co-authored with Michael Baigent and Richard Leigh, exploring the possibility that Mary Magdalene carried the blood-line of Jesus Christ to the South of France, where it is protected today by the secret society of The Priory de Sion. It was at this time that we had a visit from Simon Cox, who was making a film about the book he had written called Cracking the Da Vinci Code and we felt honour bound to read The Da Vinci Code, which we had up until this point avoided, on the grounds that it was too damn popular and everyone else seemed to be reading it. Much to our surprise we really enjoyed it and recognised the many allusions to Rennes-le-Chateau and The Holy Blood and The Holy Grail, which had become a bit of a fascination for us both. 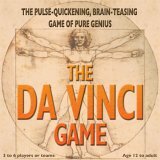 Several months later, while watching Martin cut up tiny bits of paper for yet another game he was inventing for our children, I asked him with some passion why he didn't make a Da Vinci Game? He replied, very sensibly, that there must already be hundreds of them. I looked for them on the Internet and couldn't find any. At this time, our lives became very chaotic as we had a week earlier exchanged on a new house and accepted our first booking for the floor we occupied which, as anybody with small children will know, looked like a toy shop, or perhaps a toy repair shop, with toys and bits of toys scattered everywhere. We informed our builder Fran that we were going to create 'The Da Vinci Game'. She was underwhelmed. Three months later we trialed the game with our buddies and after incorporating their suggested changes, we sent it by email to a games agent called Games Talk, who had warned us that it took them two weeks to review games. We were amazed and overjoyed when Games Talk phoned us up breathlessly that afternoon. They said that rather than representing us as agents, they would like to produce the game themselves by working closely with Fun and Games, who would license the game for us. Shortly afterwards Iain from Games Talk and Derek from Fun and Games flew over to France to meet us and the process of producing 'The Da Vinci Game' was underway. Iain loved the design and clues in the game but suggested (in a way that brooked no argument, but was nevertheless gentle) that we completely rewrite the rules. Martin had a moment's creative pang which he quickly overcame as he realised that Iain's new rules reflected the many years that they had spent in the games industry and that the new rules would also make the game considerably more dynamic. The word from Games Talk was that is was important to finish the 800 clues as quickly as possible (we had about 150 at this stage), so we set to work on creating the other 650. For three months we started to think and talk in iambic pentameter and riddles. Our children had to put up with tired and grumpy parents who didn't get enough sleep and responded far too often to their requests to play with that dreadful word, 'later'. They were eventually won over to the cause by the promise of a trip to Disneyland Paris, which we decided then and there to use our first royalty cheque to pay for. We finished everything in July and thanks to the incredible energy and dedication of Derek and his team at Fun and Games, who have worked tirelessly to get the game to the distributors and retailers, it is now available to the general public. It seems incredible that the game that we started in February 2005 was in the shops by August of the same year. It's great to know that people as far flung as New Zealand, Australia, Ireland and the UK are sitting down, playing The Da Vinci Game. A game full of peaceful symbolism and exciting people and places hidden poetically in riddle and code. It's a thrill for us to hear how much fun people have playing it. Oh, and we've also had our fantastic holiday in Disneyland, Paris. You may also be interested in the Decoding the Lost Symbol Board Game.